*New patients will require assessment and xrays. How long have people been whitening their teeth? Believe it or not- people have been whitening their teeth for the last 100 years - a bright smile never goes out of fashion. 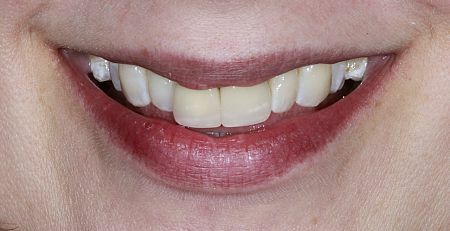 Even healthy teeth can appear yellow or dark as people get older. Some teeth appear darker if the root has been damaged or diseased where the root has died. Drinking red wine, coffee, tea or smoking over an number of years will also change the colour of your teeth. After first checking that your teeth and any fillings/crowns etc are secure, healthy and sound, accurate moulds are taken and bespoke, comfortable transparent plastic trays are made for you to wear at night for between 1 week and 3 weeks. We monitor your progress weekly to check on the health of your gums and teeth and to check that satisfactory lightening has been achieved. Hydrogen peroxide is very effective in whitening teeth both outside and sometimes inside (if the root is dead). 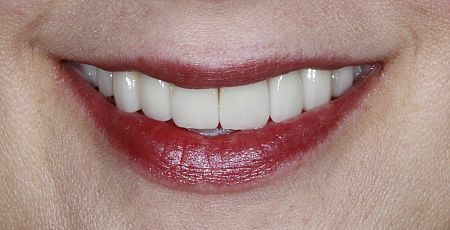 Tooth bleaching is completely safe as long as the bleach does not touch your gums and burn them. We use a specially formulated enamel and gum friendly hydrogen peroxide gel. Creating Tooth Ache or Tooth Nerve damage... any existing filling may be vulnerable to whitening gel seeping around the filling and toward your tooth nerve. That may create toothache and even in some cases be the last straw for an already compromised nerve. Thats why its much wiser and safer for your dentist to carry out the whitening. He/She will carefully assess your teeth to prevent this possibility. Sensitive and sometimes highly sensitive teeth... Your Dentist/Dental Therapist will also assess your gums prior to whitening. Where you have a little of the root of a tooth exposed either through gum disease or previous 'over vigorous' tooth brushing, the tooth mat be quite sensitive/sore in response to the bleaching agents in whitening gels. It's inadvisable to whiten your teeth without proper gum checking. If you have a root(s) exposed, your Dental Therapist/Dentist may recommend a special desensitising procedure prior to whitening. Uneven Whitening. Existing Crowns will not lighten during the whitening procedure and may lead to you being unhappy with the results of 'Self Whitening'/Shopping centre Whitening. Avoid a shock by getting a dental professional to look after the procedure and advise and sometimes prevent you needing a costly crown replacement to match your new teeth colour. Stinging Gums!- Sometimes when you whiten your own teeth without careful supervision by a professional you will notice your gums may shock you by going white! This is temporary usually lasting only 30 minutes, however it may alarm you. Rinse your mouth well and get professional guidance. Rarely you may get an allergic reaction to the peroxide agent within proprietary whitening gels. Rinse and contact your GP if it worsens/persists. In Summary you can sometimes save money by going solo/using Shopping Centre whitening, however is it really worth the risk and possible additional expense of an unsatisfactory, even dangerous reaction/result!!!! Please leave it to the professionals for your own safety and for genuinely positive results. If you have a question about our cosmetic treatments either Ask Dr Miller or fill out the provisional appointment form on the right. Alternatively, you register for a cosmetic dental consultation from one of our professionals, just complete the contact form or call the practice (available for a limited period only, so hurry!). * Offers on our site are subject to change so don’t miss out on a brighter smile today! The dentist will use putty-like material to make moulds of your mouth (impressions), so a dental technician can make the tray to fit. At the next appointment the dentist will check that the trays fit and will show you how to put the bleach in the tray at home. The dentist will give you two weeks supply of jelly to use at home with the trays which will fit closely round your teeth. The tray makes sure that the jelly does not burn your gums. You will need to put the tray in your mouth for a few hours on several occasions, over a period of a few weeks, until the desired brightness is achieved. Pop into practice if you have any more questions regarding the procedure and to take advantage of our special offer! Alternatively fill out the form on the right and we will get back to you ASAP. Effective tooth whitening requires prior assessment and monitoring through the treatment process to avoid potential problems.